I run a healthy living group on Facebook. The other day there was a discussion about some Quinoa Spinach Patties from Costco. They sounded amazing, but the ingredients were less than desirable. So I decided to attempt a homemade version of Quinoa Spinach Patties based on the ingredient list. They came out delicious! This recipe is very easy to make too. You can eat these Quinoa Spinach Patties on a bun like you would a veggie burger. Or you can serve them as is with a side of veggies. I topped mine with a little avocado and ate them with some roasted vegetables. I am not a big bread fan, so I preferred them without the bun. These patties would also be good on top of a salad or in a lettuce wrap. So yum! 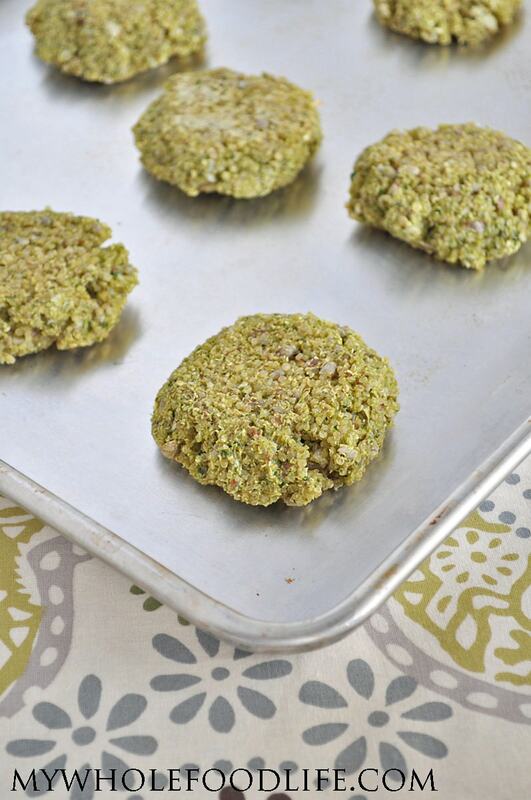 These quinoa patties are vegan and gluten free. A simple and delicious meal that is ready in under 30 minutes! In a food processor , add the quinoa, onion and garlic. Pulse a few times to chop them up a bit. Then add the spinach and continue to pulse. Add the remaining ingredients and mix until everything is combined. Form patties using a 1/4 cup measuring scoop and place on a lined baking sheet . Bake in the oven for about 12-15 minutes. Flip them halfway through. Let the patties cool completely before removing them from the baking sheet. Store these in the fridge in an airtight container. They should last a week. You can also freeze them for longer storage. Enjoy! What is a 1/4 inch measuring scoop?! (Spellcheck error ?!) and how does one make a "flax egg"? I wonder if kale would be too strong tasting for this. I have too much kale! I think kale may work. Either kale is too strong-tasting or I used too much, but I advise caution on the kale. Watercress might be good. Oh good to know. Maybe baby kale would be better? It has a milder flavor. 1/4 inch? Or 1/4 cup? Are these really small patties? Do we flatten them out a little? Thanks! 1/4 cup. They are smaller patties and I flattened them slightly. Hello! Thanks for all ypur great recipes :) Just want to double check....is the quinoa measured before or after cooking? Thanks! I love everything quinoa and these are just perfect! I'll add feta cheese too! Thanks for sharing! What is the best way to reheat these? They sound wonderful, and I like the idea of adding features! Thanks for your recipes, BTW! Thank you! You can re-heat them in the oven or in the microwave if you use one. This looks wonderful. With what can i replace the oat flour? can't eat oats. Thank you! You can probably use another flour. Maybe gluten free all purpose? Just made these for dinner tonight using all purpose gluten free flour!! My family loved them! I added a slice of tomato and a thin slice of mozzarella and back in the oven for a few minutes Served as a side dish love ur recipes! Making the pumpkin energy bites tonite! I used 1-1/4 cup uncooked quinoa to end up with 2-1/2 cooked ... and I ended up with WAY more than 2-1/2! So, it was good that I had plenty for the recipe, plus another quinoa recipe. :) These are good little patties to start with (I got 12 from the recipe) for a meal. I'm glad I had read through the comments for ideas. We topped ours with feta cheese, tzatziki sauce (made w/Greek yogurt) and slices of tomato. Yum! The hubby stuffed his in a pita bread along with some cucumber slices, too. Fresh juicy oranges for dessert & we had a great dinner. Thank you! You're welcome! Yummy topping ideas too!